Hollywood may be a moral wasteland, the epicenter of cultural corruption, a modern-day Gomorrah driven by vanity and venality—but what the heck, it sure cranks out some nice movies (as it did in the 90s – 1996 to be specific). Fly Away Home (1996) not only reminded that good movies still happen, but, following as it did on the heels of so many fine children's films, it makes me wonder if the early 1990s weren't the richest period ever for family movies. In 1995, we saw the charming talking-pig movie Babe and the funny, innovative Toy Story. In 1994, there was the magical Secret of Roan Inish from John Sayles, and Gillian Armstrong's remake of Little Women with Winona Ryder—the finest version ever of the Louisa May Alcott warhorse and one of the best films of that year. Frances Hodgson Burnett's The Secret Garden and A Little Princess were given visually sumptuous adaptations, the first in 1993 and the other in 1995. Disney, of course, still releases a major animated film each summer; although it’s recent efforts strike me as more tasteless. And these are just the cream of the crop. Add to those all the satisfying bread-and-butter and also fantastic kiddy films that come out every year, like Kungfu Panda, Smurfs, Rango, Cars, Hugo, Up or the more recent Adventures of Tintin, and we're talking profusion here. For this reason, I don't buy the argument that Hollywood has deserted family or moral values. If you haven't seen Fly Away Home yet, I heartily recommend it. This tale of a Canadian girl who raises a flock of orphan geese is the kind of family film that functions on an adult level, so don't pass it up just because you don't have kids. At the risk of trashing my hard-earned standing as a killjoy, I have to say that I found the whole experience to be cheering and even inspiring. The film is directed with complete self-assurance by Carroll Ballard, who, by my count, has directed only 6 previous efforts in the past 30 years. I skipped his Nutcracker (1986), but I enjoyed his other works: The Black Stallion (1979), Never Cry Wolf (1984), Wind (1991) and the superb african adventure Duma (2005). Each is memorable for its natural scenery perhaps the decisive factor Ballard uses to choose his sporadic projects. One thinks of the magnificent coastline vistas in The Black Stallion, the breathtaking Arctic wilderness in Never Cry Wolf, the seascapes and desert country in Wind. 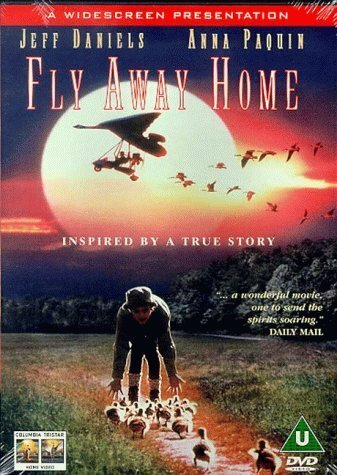 For Fly Away Home, Ballard reteamed with Caleb Deschanel, his Black Stallion cinematographer, and their collaboration has made this film another rich visual experience. From macro photography of hatching eggs to funny ground-level tracking shots of goslings to dramatic aerial views of autumn landscapes in Ontario, this film offers constant visual diversity and some gorgeous imagery. Composer Mark Isham, whose synthesizer-heavy soundtrack enhanced the otherworldly strangeness of the northern wilderness in Never Cry Wolf, contributes a traditional and enjoyable score to Fly Away Home. Fine performances come from Anna Paquin in the lead and Jeff Daniels as her father. And a special tip of the hat to the special effects team, who, through state-of-the-art composting and digital animation, create the illusion that we're flying alongside a flock of geese. I find it fulfilling to see a film in which quality special effects are smoothly integrated to support a good story, as opposed to an adrenalized concoctions like Transformers (2007) or Twister (1996) where the effects become the film's raison d’être. This movie simply would not have worked if filmed before the 1990s or now in 2000s, because the crucial flying scenes would not have been convincing. In a time when we can expect to be swamped with films built around the new digital technology, Fly Away Home proved that you could put the digital tools to the right use without superseding the movie’s soul. Highly recommended. I happened to go through your blog a couple of days back and was impressed. Let me get straight to the point. We have a forum at www.chennaichatter.com exclusively for Chennai-ites where we discuss various issues pertaining to Chennai and the nation. I think it would be great if you join us and take part in the debates. It would add a whole new class to the discussions. Oh this takes me back to my childhood. The sundtrack of this moviewas that one of Aerosmith right? Anyways, I want to say that I saw it again last year since I travelled to Argentina, decided to rent apartments in buenos aires and one of my roommates had not seen it so I told her: "you need to watch this film". She said yea and I enjoyed it too!